Styled with bodycon tube skirt . Love this. Ordered another color. Fantastic fabric and support for wearing without a bra! Beautiful neckline and back line. I love this top so much but I got maybe 6 wears out of it. I brought this to the dry cleaners twice because I did not want to risk ruining it in my washing machine. It is so delicate the material became fuzzy in areas to the point that it looks terrible to wear. Unfortunately I bought this material in 4 more other tops. The top is beautiful and has an amazing fit but for the price and how delicate it is it is not worth it. I love this top so much! It can be styled either up or down. I love staple pieces that just add to anyone’s wardrobe. I had purchased this amazing piece a few months prier, after trying it on I fell in love! I recently purchased it in a handful of other colours. Long lasting material as well. Such a universally flattering style. I also thought I’d mention, I’m so glad that Babaton decided to launch a bigger range or variety of colours. Which means any skin tone can rock this top! Thick, quality fabric with a super flattering cut. This crop is the perfect length. I ordered an xs, my cup is 32DDD. The coverage along my bust is absolutely perfect and the lower half of the top hits just above my belly button. It’s definitely a staple of my wardrobe. The neckline is so flattering, and the top itself is SO comfortable! I definitely want to buy this top in more colours! It’s great I have it in 3 colours but it piles after a few washes. My daughter loves this top and we have purchased in 4 colors. It's a staple in her wardrobe since it's simple and easy to style. Love the quality and durability of this top. Got it on sale but would purchase at regular price. Daughter is petite and slender and xxs fits great. Love it. So stylish and comfy! Have this shirt in three colours, i looveee!! 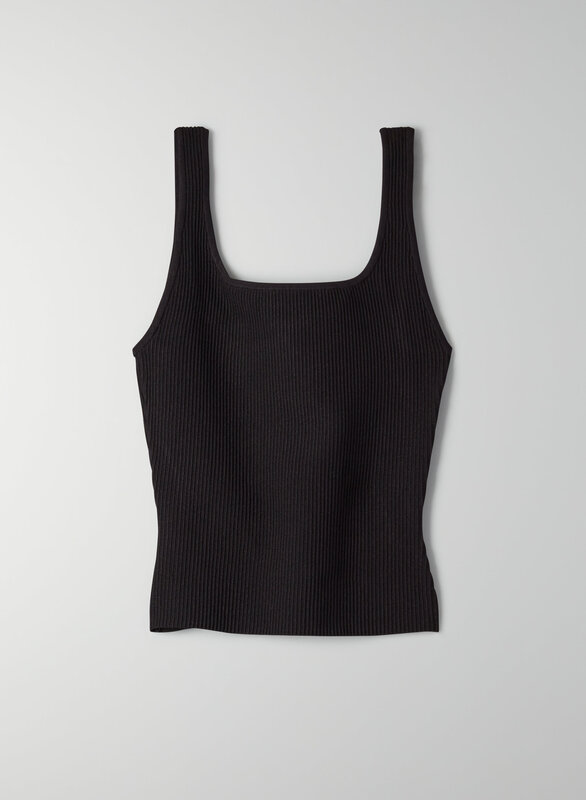 The Arjun knit top is such a good basic to own! The BEST quality, it's a staple in everyone's wardrobe. I can't wait to get more colours! I’m usually in US size xs and this in s fits perfectly. The material looks very good quality and it just looks so so flattering. I look fitter in this tank.